Last night I stayed up until 1 am, something I rarely do, simply waiting for a break in the heat. When I finally let the dog out for the last time, the sky was a blackened haze, the moon dyed red in oppression. In bed we slept half naked without sheets and still we sweated. YES I realize I’m being dramatic, but this is truly the hottest weather we’ve endured since moving to Maine, and it’s made my family feel like we never left Philly. There, summer stretched endlessly, each day seemingly more humid and unbearable than the last. An armpit of a place. (No offense.) But here?? Cold salads are sustaining us in these trying times. 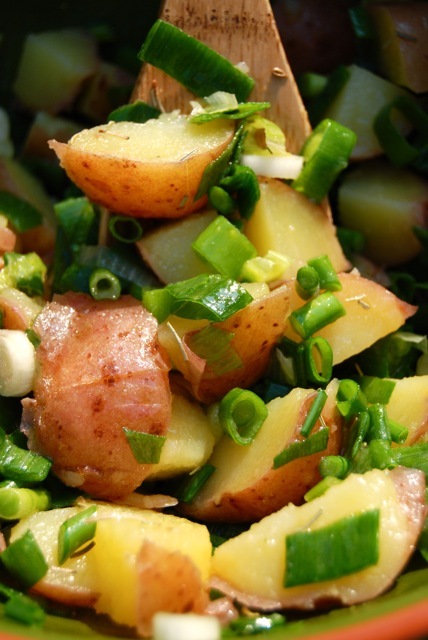 This toothsome concoction of potatoes, scallion and garlic is hefty enough to be filling, yet light enough to refresh. The real showstopper in this recipe? Garlic scapes. When I first encountered these curly tendrils several years ago, I didn’t know what to make of them. They looked unfamiliar and slightly suspect – like something I’d have tossed without reservation into the compost. But they were indeed a part of our CSA delivery and remained so for a period of weeks. After a few tries, I was hooked. Garlic scapes are milder in flavor than their cloved counterparts. They can be minced finely, or sliced more like green beans. Eaten raw. Sauteed. Everything in between. They’re terrific. If you’ve never seen or used them before, here’s the perfect excuse to head to a farmer’s market tomorrow and pick some up. (PS: My current CSA, Fishbowl Farm, is selling them 10 for $1. TEN for ONE DOLLAR. If that’s not the best buy ever, I don’t know what is!) No scapes to come by? No worries; simply substitute regular garlic and enjoy! Happy Weekend. Once cooked, remove from heat and place under cold water. Drain and set potatoes aside to cool. Once cool enough to handle, cut into cubes. 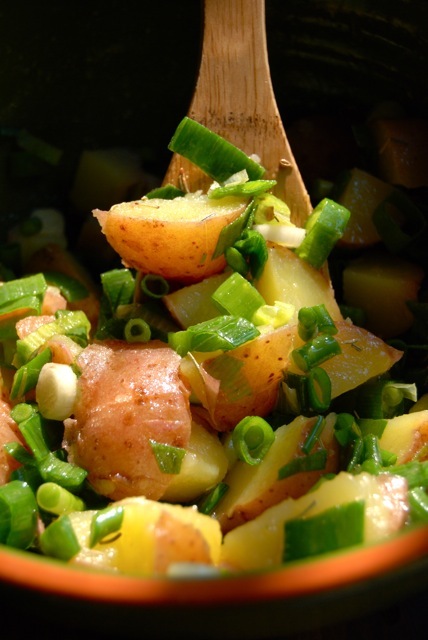 Place cubed potato, along with the garlic scapes and scallion, into a mixing bowl and toss to combine. Measure the olive oil, vinegar and rosemary into a small mixing bowl. Add freshly ground black pepper to taste; whisk well to combine. Pour the dressing over the salad and stir gently to coat. Cover and refrigerate a few hours before serving. This entry was posted in Salads and Dressings and tagged low-sodium recipes, picnic fare, Simply in Season. Bookmark the permalink. This looks really good and not heavy like potato salad can normally be. What neat perspective in that picture. Is that a mirror behind the salad? Also, do you not have air conditioning?! are you telling me that you don’t have AIR CONDITIONING in your house??? really? not even a window unit or five? i am weeping for you and can’t imagine how you’re dealing with this monstrous heatwave. now, on to scapes. thank you so much for educating me–i’ve seen these guys all over the farmers’ markets but had no idea what they were or what to do with them. while i’m not a huge garlic fan, i sometimes use a clove or two for flavor (and then remove it before serving) but these guys seem ideal, especially if they are more mild! love it. Thanks Susie! It was delicious, not heavy at all and just as good the next day. Hope you enjoy it! Katie, no mirror – just shaded lighting outside. I get very different results depending upon time of day (and season). Keeps me on my toes. And YES WE HAVE NO AC! But before you start to weep for me, I must remind you, we wouldn’t need it more than a couple times a year. Many businesses up here don’t even have it — including universities. My husband’s old office was a sweat box all summer long. So glad he’s working elsewhere now! Nope Nat, no AC. We do have a bunch of fans, and thankfully today it’s back to a perfect 75 degrees at noon. Ahhhhhhh…. Doesn’t that look good! I love scallions in a salad.